The last few weeks have kept me busy painting away, but I finally completed my first platoon! here are some shots of the finished product. Nice work! They look great, and the movement trays are very stylish too. 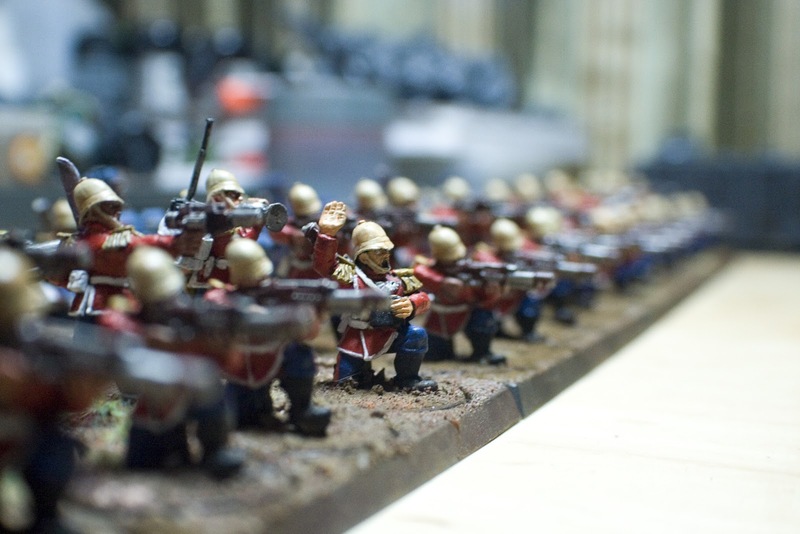 How did you get all the 'firing' posed miniatures? I know you used to be able to order specific models from GW but I can't find it any more :( was hoping to do somthing similar with my Mordians. to be honest I got lucky with ebay to get them all in the right pose. Top work fella! Love the picture of them in square! The Movement trays are a great idea and they look really cool all rank and file in them. One observation (please take as constructive comment!) is just the grass on the bases. You may have just not done the rest (in which case I will wind my neck in!) but the one on the left hand side in the square picture and that top left heavy look much nicer than the rest because of the grass distribution. The others look a bit bland in comparison and doing the same will really make them ALL stand out imo. Anyway congrats on a job well done! Guess I breezed by the grass in my joy at having finished the paint. I'll add that tonight. HA HA!! Yes! The Praetorian military is ever growing! loving it. Blue cannons, yeah it works well. It's always hard to figure out the colours for the cannons. good choice. Personally I don't mind the bases at all, I mean if they are in the desert, then they are in the desert! lol. The stripes on your chainswords are nice and clean - but I'll tell you my secret to get them even straighter- go down to your local miniature hobby shop and find some Tamiya masking tape and tape up the stripes before you paint. It makes it sooo easy it's like cheating. Don't bother with regular tape, it will be too much of a headache, but the proper modelling tape is ace. Looks very nice! Do you actually use the movement trays in game? @ Col. Ackland. I picked up some of the Tamiya tape last night. I'll be putting that to use on future projects. Thanks for the tip and looking forward to seeing your work. @Boxersaint. Thanks for taking a look, as for the movement tray, I do use them in games to speed up movement and deployment. more often then not this squad ends up huddled behind and aegis line so the tight formation is generally only an issue if the enemy closes with flamers or has indirect fire abilities.